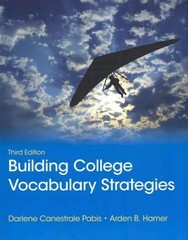 Building College Vocabulary Strategies 3 Edition Basic College Vocabulary approaches vocabulary development with a unique and proven systematic strategy called SSCD– See and Say the word, use Structural analysis, apply Contex t clues, and incorporate Dictionary knowledge. A systematic vocabulary development strategy–Uses SSCD: See and Say, Structural analysis, Context clues, and Dictionary knowledge to help students acquire new vocabulary. By providing dictionary definitions of each unfamiliar word, reading is not interrupted and greater comprehension is attained. Seven Steps to Improving Memory– based on John Langons’s “Seven Steps to a Powerful Memory” from Reading and Study Skills. These tips provide valuable strategies to help improve retention of material. Gives students additional tools to improve memory and learning. Memory Tips & Learning Strategies- Each chapter includes a "Memory Tips" and "Learning Strategies" which assist students in learning new vocabulary and can be applied to a variety of learning situations. Comprehensive pedagogy– Each chapter contains “Words to Learn,” “Power Words,” “Chapter Review,” and “Puzzle Fun.” These activities enhance a student's learning by providing interesting and compelling practice and review.